Lokomotiv Moscow have never been a club content with mediocrity. After years as one of the outsiders in Moscow, let alone the wider Russian league, they surged to prominence at the turn of the millennium, finally clinching a maiden top flight title under the management of club legend Yuri Semin. In addition to cementing themselves at the top of the domestic league, the side also embarked on something of a love affair with the national cup competition, claiming the trophy on no fewer than five occasions between 1996 and 2007. More recently however, Lokomotiv have struggled to maintain their competitiveness in a league increasingly dominated by a handful of richer clubs. Zenit St. Petersburg enjoy the backing of state energy giant Gazprom, Moscow rivals CSKA and Spartak are the beneficiaries of lucrative oil sponsorships, whilst new boys Anzhi Makhachkala are the talk of the town after being taken over by billionaire Suleyman Kerimov. With their own owners lacking the bottomless pockets of their rivals, it is not difficult to see why Lokomotiv have begun to head the wrong way down the Russian Premier League table. Last season represented something of a low point for the Moscow side – struggling with inconsistency all season and suffering from the controversial sacking of manager Yuri Krasnozhan for his suspected part in alleged match-fixing, Lokomotiv went through no fewer than three different managers and limped over the line in 7th place, ending the longest ever Russian season without even as much as a Europa League qualifying place. Jose Couceiro, the journeyman Portuguese brought in to improve the situation, was seen as a failure by the board and their decision not to renew his contract saw Lokomotiv once again looking around for a new man to take the helm. The Railroaders’ replacement for Couceiro has raised more than a few eyebrows. While many expected another relatively low profile manager to step into the role, and others suggested promotion from within might be the way forward, few expected the arrival of one of world football’s most respected young coaches in the form of Slaven Bilic. Even when the former Croatia boss announced that he would be stepping down from his role with the national side after Euro 2012, it was only a small minority who predicted he would be turning up at Lokomotiv. 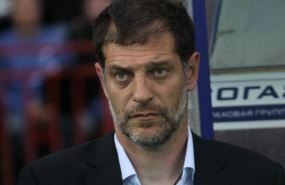 It is a move which could yet make or break Bilic’s young managerial career. Thus far, he has enjoyed remarkable success with the country of his birth, both at under-21 and senior level, but other than a five-month spell in charge of Hajduk Split, the 43-year-old is yet to be tested at club level. Here, the motivational skills and tactical ability which he is renowned for must be combined with an ability to play the transfer market and get the best out of his players for more than just six weeks of the year. Yet in many ways Bilic and Lokomotiv should be a perfect match – both are ambitious, relatively new to the top of their game and determined to prove that their past successes were more than simple flukes. With the new Russian season under way after the Super Cup between Zenit and Rubin Kazan, Lokomotiv will be under more scrutiny than ever as spectators line up to analyse the new man in charge and his team – as manager of an intensely passionate nation, Bilic will be more than used to the pressure. He has already made some impressive moves in the transfer market, acquiring countryman Vedran Corluka from Tottenham Hotspur and Dynamo Moscow’s winger Aleksandr Samedov, who moves back to Lokomotiv having left in 2008 after a four-year spell. If Bilic is able to keep hold of star men Denis Glushakov and Dmitri Torbinsky, there will be every hope of Lokomotiv improving on last season’s finish and fighting to claim one of the five European places available through the league. Given the apparent decline of Rubin Kazan and unpredictability of many of Russia’s top sides, it would not be unlikely. Perhaps equally interesting will be the Lokomotiv board’s patience should their new Croatian employee not live up to expectations – Bilic is sure to be on a lucrative deal, so cutting their losses at the first sign of failure may not be possible. Furthermore, given the club’s recent history of managerial instability, the Railroaders would surely be foolish to dispense with an obviously talented leader should things not instantly go their way. With an ambitious upper mid-table team, a formidable chairwoman in Olga Smorodskaya, and a new environment to test himself in, Slaven Bilic has certainly landed a challenge at Lokomotiv. If he can rise to it, his team could easily shock the established order.